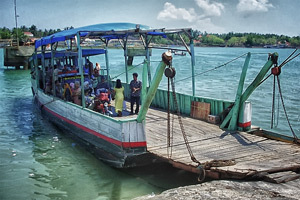 Kalianget Port connects the islands in Sumenep regency. It is located in Kalianget district, Sumenep regency. Kalianget Port is divided into two parts, on the south side is the Port used for general activity. This Port is used for people who want to cross to Poteran island and the other islands such as Kangean, Sapeken, Masalembu and surrounding islands. Beside that the Very also crosses to Jangkar Port in Situbondo. So if one wants to go to Bali from Sumenep, he can take Very from Kalianget Port to cross to Jangkar Port in Situbondo, which needs more than four hours, and then go on his trip by bus from Situbondo to Banyuwangi and crossing the Bali strait. The Kalianget Port on the north is specially used by PT. GARAM for sending its salt product to other cities and islands in Indonesia. If you enjoy marine tourism, try to visit Kalianget Port. You will find many marine activities here. This port used as sea transportation to the Islands belong to Sumenep Islands. If you want to visit Talango Island for having pilgrimage tour in Asta Yusuf grave, you will get the sea transportation in Kalianget Port.